Is it just me or is camo becoming the new black? This coming season camouflage is having quite a moment, going toe to toe with the fall favorite leopard print. 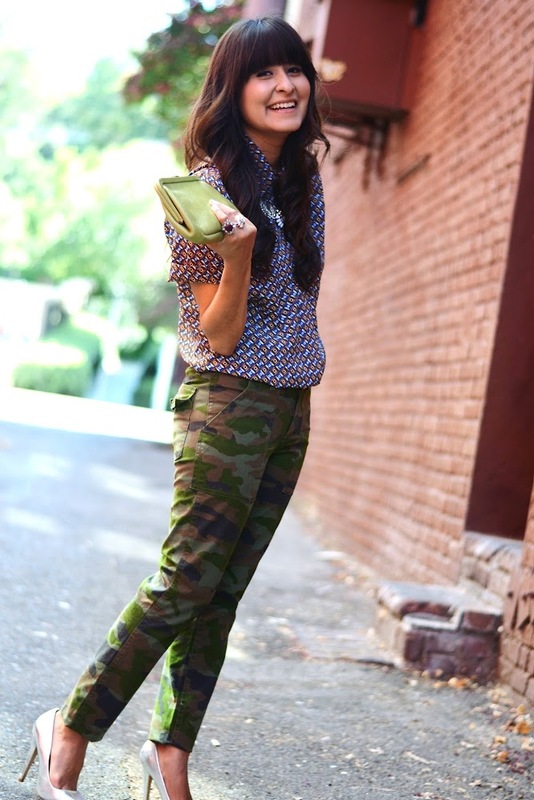 A bit out of the box but refreshingly edgy, camo paired with classic pieces can really add a new dimension to a wardrobe. I explored camo for the first time, starting with a pair of utility pants from J. Crew's fall line. Unsure if I could pull the print off I decided to start with a look in my comfort zone mixing it with another print. I pulled a quirky vintage blouse, with a built in button, playing up the outfits details with silver pumps and sparkly baubles. How would you do camo?